Frank W. Kocher Memorial Park is located on Fishing Creek off of Rte. 487 North, near Lightstreet, PA.
Free and open to the public. Please help us keep the Park clean by picking up after yourself and your dog. Become a Friend of Kocher Park! Donations enable us to maintain the Park. Please consider becoming a Friend to help keep Kocher Park beautiful! All donations are tax-deductible. Head on over to the front page for upcoming park event and cleanup info! 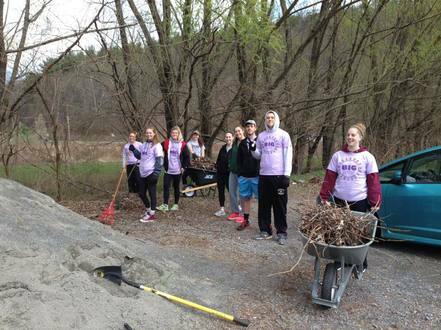 Special thank you to Bloomsburg University swim team and other volunteers who helped make our 2016 Spring Clean up a success!! 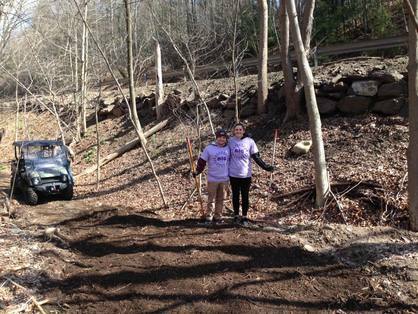 The new property and trails look awesome! Thank you again to Dunkin' Donuts for providing refreshments to our hardworking crew. Thank you to Girl Scout Troop 30185 for their hard work and dedication to create this wonderful tree identification project for Kocher Park! Click here to access real-time water quality data for Fishing Creek collected at Kocher Park. Thank you to Dr. Steve Rier, PhD, Bloomsburg University, for his hard work and coordination efforts to acquire funding, install and maintain the monitoring station, and collect the water quality data.